Posted on September 27, 2013 by J. In a good, tight script, every word is essential. But essential is not the same as important. Storytelling is about ebbs and flows, with a general upward trend in terms of tension, until you reach the climax. It’s not a straight line to that climax. It’s a very wavy line. Good playwrights know this. Group scenes are followed by intimate, two person scenes. Raucous scenes by quiet ones. Passionate confrontations by comic moments. One reason for this is to give the audience time to rest. A play that goes full tilt from start to finish will exhaust the audience by the end. They want to be exhilarated, not exhausted. Audiences also need time to absorb big emotions or meaning. Remember, the audience has just met these characters and this situation. There is a lot of new information packed into two hours, and they need time to process it during the play itself. The ebbs and flows permit this. The third reason is that change is simply more interesting than the status quo. Audiences like unpredictability. It holds their attention. 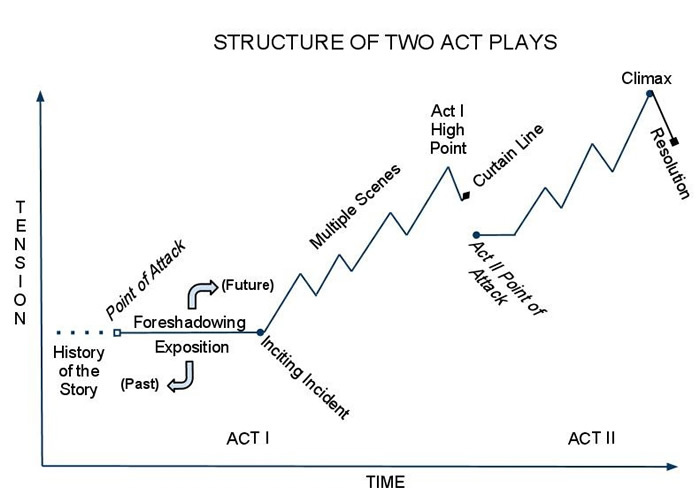 It’s fairly easy to see the big ebbs and flows of a play: the dramatic scene, the quiet scene, etc. But these ebbs and flows operate on a smaller level, too, within the scene (we call them “beats.”) And they often operate within your character’s emotions within a scene (a scene that is just about you being “angry” is going to be boring), and within a single speech. Even a three sentence speech can have this sort of movement. Certainly the one-minute monologues we’ve been working with do. Moments of powerful emotion for the actor. These are what I call the “money moments”. Plays are sprinkled with these moments – they don’t just appear in the climactic scene! So one of the things we’ll work with is how to play the “important” stuff, which is where your “wow” moments come! This entry was posted in Acting, Directing, Script Analysis and tagged Acting, acting technique, Actor, Community Theater. Bookmark the permalink.